Oialla is the brainchild of top Danish chef Rasmus Bo Bojensen. Rasmus has cooked in the top kitchens of Europe, and run a number of his own restaurants for over a decade. He recently opened a restaurant in a tower of Denmark’s parliament building in Copenhagen, a visit to which is a must for visitors to the city. While his passion for food is instantly apparent to anyone who meets Rasmus, Rasmus’s adventures in cacao were inspired by his wife’s lifelong love of chocolate. Oialla is committed to coaxing complex flavours from fine cocoa. 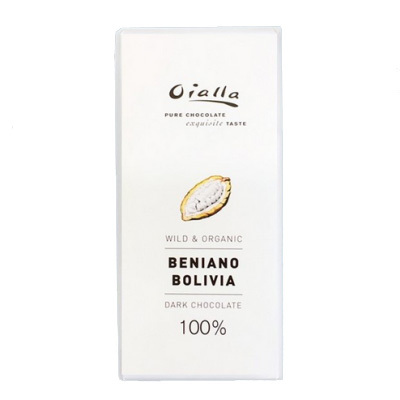 This bar is crafted exclusively from cacao from the Alto Beni region of Bolivia. Bolivian cacao is known for its honey like profile, and these notes are certainly present in this bar. It has a remarkably even melt, and a richness derived from the flavour of the beans and the rich, fudgey texture of the bar. Mild 100% bar, it’s a bit too butter-y for me, and I can’t taste much flavour.